The MP41 was not described in the gerätliste since it never had a military (Wehmacht) status. Why the MP38 and MP40 were called the "Schmeisser"
Every book written after the early fifties states that Hugo Schmeisser did not have to do anything with the mp40. Most writers of these books base their information on previous books without having checked the patents and interviewing people who were involved in the design and production at the time. I'm not claiming that I have done this but further investigation and correspondence with experts in the field of small-arms, who have the following information first hand, leads me to belief that the statement that "Hugo and Hans Schmeisser did not have anything to do with the design" is a misunderstanding. The main reason why this has come into the world is probably the fact that Erma wanted to do business in the United States after WWII. The American sportshooters were of course a very interesting and huge market. During this time they came in contact with the company "Interarmco Ltd" based in the the United States. Since the mp40 had built up such a notorious reputation during the war, Erma wanted to impress their future business partner wih this fact. They simply "forgot" to tell that almost the entire design was based on patents of Hugo Schmeisser. This was easy since Hugo Schmeisser also died in this same period after coming back from a long period of Soviet captivity. Another event that helped disregarding the role of Hugo Schmeisser was that the important "Small Arms" series of books claimed that Hugo Schmeisser only role lay in the fact that Haenel also produced the mp38 an mp40. Hugo Schmeisser was the technical director of Haenel. Tricky fact is that the author of these "Small arms" series was a friend of the owner of Interarmco Ltd. The same company that had the deal with Erma! 1) So starting with the first and most important patent which is Schmeisser's patent on the delayed blowback. This invention was first used in the mp18 and has been used unchanged in almost any submachine gun afterwards. 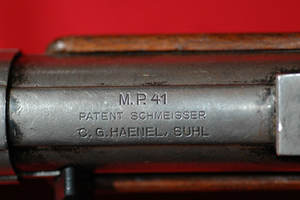 To rub it in clearly Haenel pressed it in the housing of the mp41 which is by the way exactly the same as the mp40 (see picture). 2) The seperate firing pin guided by a spring which is loose in the bolt. 3) The double stack/single feed magazine system. Initially Erma used a different system on their prototype, the EMP36. This was the same system as used in the Erma EMP. Their intention was to use this as well in the new mp38 but this was prevented by the military. They wanted Erma to use the doublestack/single feed system of Schmeisser. This is a good example of how big Hugo schmeisser influence was in the military. The patent for the magazine was of the 7th of september 1930. 4) OK, here it gets really tricky and confusing. It's stated everywhere that the telescope spring was a patented invention of Vollmer. Which is the D.R.P. Nr. 580620 of july 13 1933. However a patent which was handed out on the 27th November 1930 to Hugo and Hans Schmeisser also clearly describes a telescoping main operating spring assembly in a housing exactly like the spring used in the Erma EMP and MP40 series. This leads me to belief that that there is a possibility that the patent that is always linked to Heinrich Vollmer is actually an earlier invention of Hugo Schmeisser. The Vollmer VMP 1930 was the first Sub-Machine hat used the new telescoop spring. The earlier models like the VPG, VPGa, VPF and the VMP 1925 did not use this invention yet. I don't really understand why there would be 2 different patents on 1 invention. Maybe there are small technical differences. I don't really know. What I do know is that I have seen the patents (on photo's) of the Schmeisser patents and not of the Vollmer patents. If you have any further information or copies of the patents please let me know. 5) Then the folding stock. Again a revolutionary patented invention of Hugo Schmeisser. Hugo Schmeisser already applied for a patent on this invention in 1935. This folding stock is however different than the one used on the mp38 and mp40. The principle is however the same. Hugo Schmeisser's folding stock was in fact not a "folding stock" it looked a bit like the extending stock later used on the American "Grease gun". The difference lay in the fact that the part which is pressed against the shoulder became part of the handgrip when folded in. Apparently there is no patent of Erma for the folding stock used on the MP38 and mp40. Possibly because the patent office thought that the functional principle remained the same as the one from Hugo Schmeiser. Another interesting thing is that the patent office did not grant Hugo Schmeisser the patent until 1939. 4 years is quite a long grant period. Since Germany was heading for war it didn't want it's future enemies to know about this invention. In 1939 the MP38 was already spotted by the enemies and therefore there was no reason anymore to not grant the patent. The attachement of the barrel to the receiver housing is not an patented invention of Hugo Schmeisser. He used a diferent attachement as used on the MP41. Also the attachment of the reciever housing to the grip section is not Hugo Schmeisser's invention. It might be that this is an invention of Heinrich Vollmer since the Erma EMP has the same ingenious disassembly system. The mass cooling barrel was also more or less copied from the VMP models from Vollmer. Off course it was the design team of Berthold Geipel of Erma who combined the patented inventions of Hugo Schmeisser but to say that Hugo schmeisser did not have anything to do with the design is untruth.